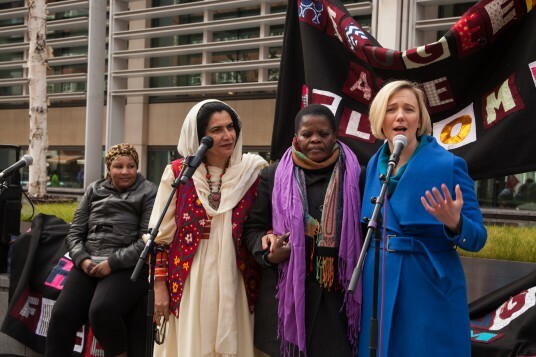 That was the message of hope from Stella Creasy MP on Tuesday 8 March, when Women for Refugee Women marked International Women’s Day with a gathering outside the Home Office. 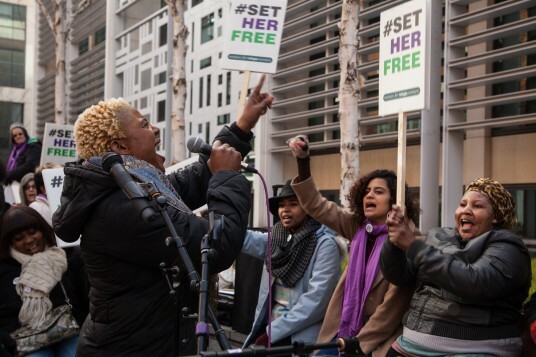 Chants of “Set Her Free!” resounded against the Home Office walls as we called on Theresa May to show compassion for her fellow women by ending the detention of asylum seekers in Yarl’s Wood. 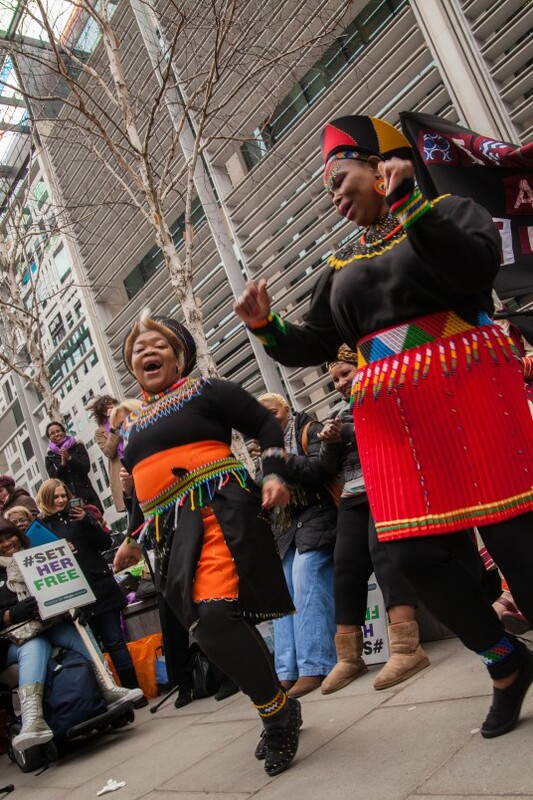 We were joined by an array of brilliant female performers, speakers, and a crowd of more than 100 supporters, including more than 50 refugee women. 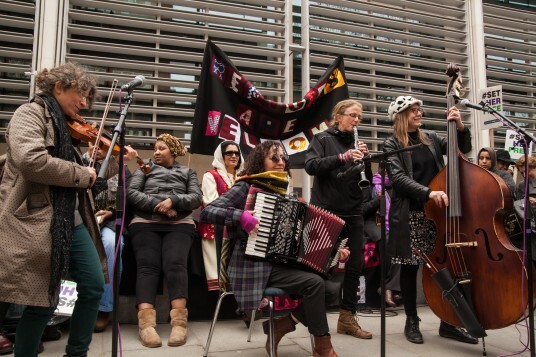 Many thanks to Shami Chakrabarti, Kate Osamor MP, Stella Creasy MP, Sabrina Mahfouz, Zrinka Bralo, Gaggle, Natalie Bennett, Lips Choir, London Klezmer Quartet, Juliet Stevenson, Nyakaza African dancers, London Refugee Women’s Forum, Sophie Walker, Demi Mseleku, Sula Mae, Caroline Lucas MP, Sajeela Kershi, Nimko Ali, and our speakers from Hope Project Birmingham and Women Asylum Seekers Together (WAST) London, for helping us to make a joyful and defiant noise outside the Home Office. 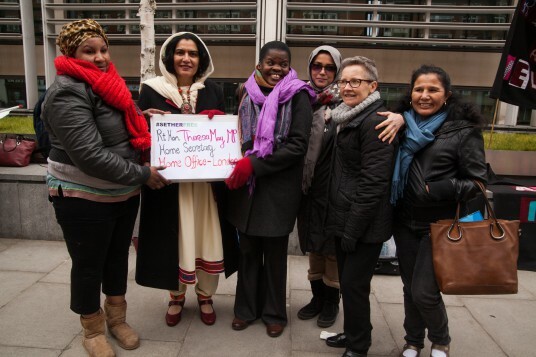 We also launched our ‘99 women‘ solidarity action, with 99 inspiring women writing messages in support of their refugee sisters, which we delivered to Theresa May at the Home Office. Check out media coverage of the event, and the full gallery of photos on our Facebook page. 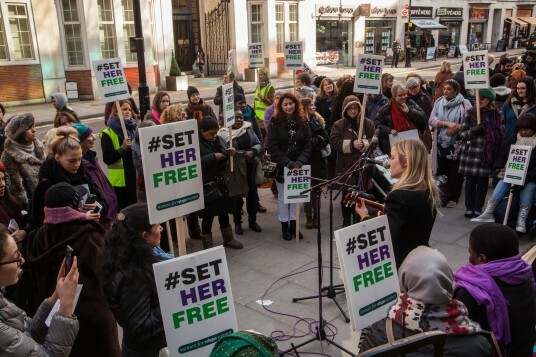 Today being International Women’s Day, I want to tell the Home Office that women are tired and fed up of being locked up in detention centres where they are mistreated, raped, and left with no help. Gone are the days when women are silenced. They nowadays speak with one voice that is unity, and share their problems. Freedom is near, women should never give up. Keep fighting the Home Office and one day your dreams will come true. This country does not belong to anyone, why can’t we all live in harmony? No one is better than the other. Home Office is not fair at all. I wonder why people have to report – it is out of order, it really is torture to the mind. All we want is to live a normal life, just like everybody else. When you are detained all your rights are taken away from you. No one is better than the other, we are all human beings, we should live in harmony and it would be a better world. We have the right to stay in this country. We know what you have been doing in our countries – creating wars, stealing our natural resources to build your own country. We have the rights to live here and no human is illegal in any country! We are here to stay for our freedom! As I can see, come on women, stop being cowards, be strong. We also need to use our voice and rights to stand and talk about how the Home Office makes wrong decisions on asylum and refugee applications. We also need to shout at them for detaining asylum seekers. No, no, no, that’s wrong.